Other people can be given Dinners with stars. The Dinners with Stars are one of the unmissable events in Barcelona’s summer season. 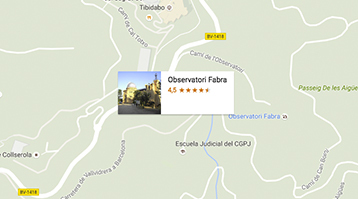 The activity takes place at the Fabra Observatory during summer months and combines scientific outreach, astronomical observation and a suggestive gastronomic offer. Both the Observatory and the dinners are located at one of the privileged viewpoints of the city of Barcelona. The evening starts with the dinner, an original and delicious gastronomic offer of astronomical inspiration, based on quality ingredients and the finest cuisine, served at dusk on the terrace. The night invites to visit the interior of the Observatory. The visit includes the museum, the noucentista hall (early 20th century) and the meridian telescope. You will enter the great dome, which preserves its original elements. You will be able to observe celestial bodies in far away constellations, stars and most part of the Solar System through the 1904 telescope, one of the largest and oldest telescopes still in use in Europe. NOTE: The conferences are in Catalan or Spanish, check the attached language below for the conference language. Come to see the first observation point of the city of Barcelona, ​​the Royal Academy of Sciences and Arts. With this offer you can discover a building hidden at a glance. In the centre of the city, the headquarters of the academy stands and, at its summit, two towers finished with a dome each, in order to make measurements on astrometry and calculate the official time of Barcelona. Do not miss this opportunity and expand your experience for 4€ and make a guided tour to one of the most historical entities in Europe, more than 250 years interacting with society. Send us your reservation code for Dinner with Stars to alex@sternalia.com or by calling 93 170 17 97 and you will get a 50% discount on the ticket to visit the Royal Academy of Sciences and Arts of Barcelona. Check in and welcome with glass of cava, beer or juice. To attend the "Dinners with Stars" you must make your reservation and fulfil its payment in advance. Fill in the form choosing date, number of participants and menu options. If you are entitled to a discount you must provide an applicable card number and present the card upon arrival. -Discounts are only applicable from Tue. to Thur. -Each ID or card allows for a discount for two people. -The ID or card must be presented upon arrival. The organization reserves the right to cancel because it does not achieve the minimum required capacity. Depending on the weather conditions the program of the activity can be modified or altered, making dinner inside or cancelling said activity. Days of cloudiness: Cloudiness can prevent correct observation an average of about three days a month. To improve the satisfaction of visitors, this year through audiovisuals, there will be an alternative activity in which you can discover one of the scientific tasks that is done to the Observatory: observation and study of asteroids. In this case, the activity will NOT be cancelled. Gift vouchers available for the Dinners with Stars. In the Gift Voucher the discounts are not applicable. They can make their reservation by phone at (+34) 93 327 01 21 (Monday to Friday 9am - 9pm) and (+34) 697 864 262 (Saturdays/public holidays 10am - 2pm).